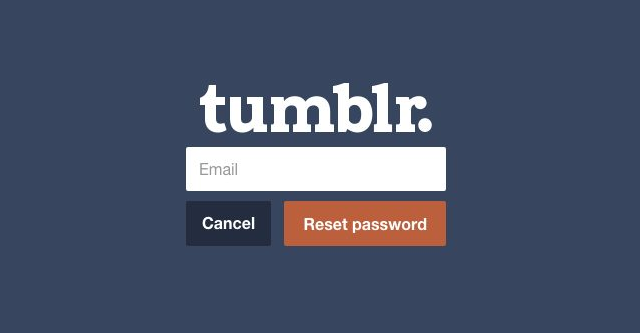 Tumblr users may have recently tried to log in only to find that they need to change their password. There's no way around it so you need access to the email you have registered on that account and this is all down to a recent data leak. According to Yahoo, the data leaked originated from 2013, back before Yahoo owned Tumblr. The leak revealed email addresses and passwords but they don't think any of those accounts have been accessed. They have asked users to change their passwords though just in case. One report has said that only users who made their accounts prior to 2013 will be required to change their password, but that's not the case. A few of the users are complaining that they've had to change their password even if they made their account after 2013. There's even a rumor going around that every single user is going to have to change their password eventually to the point that there's a post making the rounds with a warning to change your email now or you could essentially lose your entire blog. The good thing about this is that none of the accounts involved in the leak have been compromised, but you do have to wonder if it's more of a risk to make every user change their password. If someone has stolen an email address in the past, then they might be able to put that to use now. Of course, without the email, there isn't much to worry about, but it's frustrating. Tumblr users are annoyed and understandably so, they're at risk of losing everything they've worked so hard on in the past because they can't access that email anymore. I haven't had to change the password on any of my accounts but I also have access to the email addresses of the accounts that I do use. Tumblr users tend to be younger and most things they'll have collected on their blog will be important to them. This data leak has risked these users losing everything they have on there for no reason. There isn't much anyone can do with Tumblr user data and the people who have it don't seem to have even tried. It's a good thing that Yahoo and Tumblr are concerned about their users' safety, but they have caused a lot of confusion and a fair bit of annoyance. Unfortunately, this is nothing new for Tumblr. If you are on Tumblr I would make sure that your email is accessible just in case, but hopefully this will blow over quickly and nothing else will be leaked anytime soon.